The wrong anti-snoring pillow can aggravate your snoring problems and cause great discomfort as well. That is why it is imperative that you choose wisely and take every aspect of the product into consideration. This Nitetronic Pillow VS Sleep Innovations Contour comparison allows you to see exactly how good these two anti-snoring pillows are and which one of them is more likely to help you stop snoring. Sleep Innovations Contour Pillow can last up to 12 years. Keep in mind that the product may start losing its firmness after 5 years of regular use. Sleep Innovations Contour Pillow is made of comfortable, premium-quality, hypoallergenic memory foam that does not lose its shape. The pillow comes with a 100% pure cotton cover. With Sleep Innovations Contour Pillow, the adjustment period depends on your previous experience with memory foam pillows. If you are used to sleeping on memory foam pillows, you will feel comfortable right away. If you are not accustomed to memory foam pillows, it may take a few weeks to get used to sleeping on your Sleep Innovations Contour Pillow. Sleep Innovations Contour Pillow provides you with therapeutic support and helps you overcome problems caused by snoring or neck pain. Its therapeutic design adapts to the shape of your head, neck, and shoulders, gently aligning your body into an optimal anti-snoring sleeping position. It also helps reduce the morning stiffness in your neck by preventing your head from sinking into the pillow. 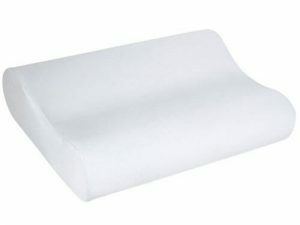 Sleep Innovations Contour Pillow is made of memory foam, which is not machine-washable or dryable. You should only spot clean your pillow with a damp cloth and clear, mild soap when necessary. Air-dry only. Make sure your pillow is completely dry before using it again. Sleep Innovations Contour Pillow has no known side effects. Sleep Innovations sells its products exclusively through online merchants and major retailers, so it does not have an official refund policy. If you are unsatisfied with your pillow, you will have to contact your retailer for more information on refunds. Sleep Innovations Contour Pillow comes with a 5-year warranty that covers any defects in workmanship and material. If the components are unavailable at the given moment, the company reserves the right to replace your product with items of equal or greater value. Sleep Innovations contour memory foam pillow provides support for your head and neck, preventing you from tilting your head backward. Its therapeutic design and customizable height will solve all your snoring problems. Read more about it in our review.